The best thing about this post is my daughter’s comment below it (see “Truly Blessed”), citing her “10 reasons why (she loved) homeschooling,” written after she went to college. Don’t miss it! Anna Hawthorne posted a great idea on her blog today– 10 reasons why she loves to homeschool. These are my 10 reasons why I homeschool. I love having the opportunity to mentor and coach my kids spiritually and academically. Having them at home has allowed our family to be so much closer than we would have been otherwise! I love our relationships, especially at the high school ages. It has given us so many treasured memories over the years! Our kids have had educations that suited their specific needs and learning styles. It’s been easier separating from the popular culture and not feeling the pressure to have to have certain things or wear certain brands — things other parents struggle with, even in our church. I have always been a life-long learner and have loved passing that passion and perspective on to them. As Christian parents, we are fulfilling our command to raise godly generations. It has enabled me to be in a coaching role for newer/younger homeschool moms, which has been a blessing! Homeschooling keeps my priorities aligned as I strive to be a godly example to our kids. Let’s hear your top ten! 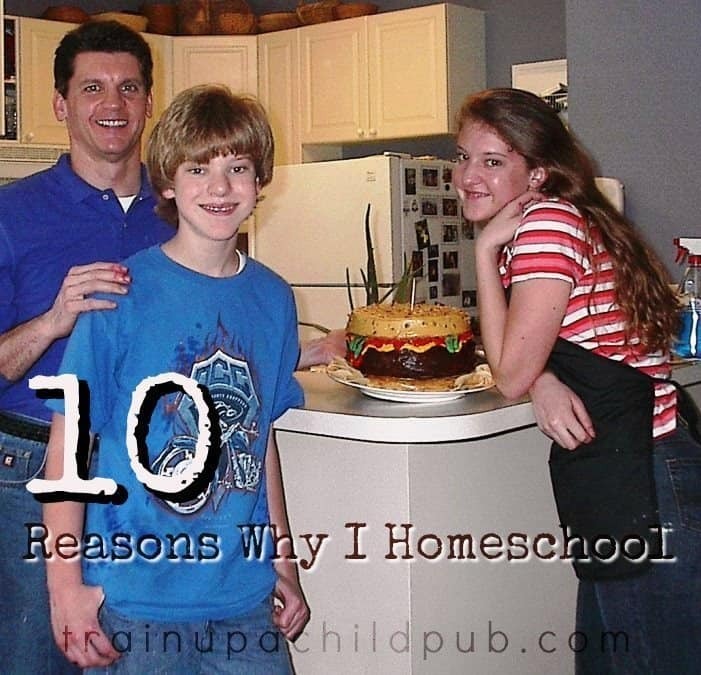 Reading these inspired me to think of my own 10 Reasons of Why I love Homeschooling! I apologize they are a little wordy but I hope it is helpful to read some from a student’s perspective! 1. My education had a spiritual element that gave it depth and eternal significance. It was an instrument in the hand of the Lord to teach me more about Him and the world He created. Everything I learned was part of a greater and more glorious big picture! 2. Getting to spend sweet times together with my family was part of my daily routine. 3.My classmates were my best friends and their siblings. They were of all ages and often possessed a rare maturity and authenticity. 4. The supportive home schooling community felt like a big family. My teachers were moms and dads that I looked up to and I knew loved and cared about me. 5. It gave me a beautiful picture of incredibly heroic and important calling that God places on a wife and mother. 6. Learning was an exciting, never ending endeavor. It was defined as a life-long pursuit instead of a chore. 7. It provided me the flexibility to explore topics that interested me and allowed me more control over what I wanted to study. 8. An emphasis was placed on personal character development and integrity. I learned many valuable life lessons that could never have been gleaned from textbooks. 10. I learned that when all is said and done it is my responsibility to master the material laid before me and learning finds its purpose, as everything else, in glorifying our Lord! It’s very helpful reading your ‘top ten’ from a student’s perspective! Thank you, Sweet Daughter, for taking the time to comment and share your favorite parts of homeschooling! I loved reading them and I’m sure your thoughts will be especially inspirational to moms who may be struggling a bit with younger students. And to Moms — keep at it and don’t give up! Your sacrifice and hard work today will bear great fruit tomorrow!